When their grandfather pays twin Rock and Brock to do chores, he hopes it'll teach them the value of saving. Brock follows his advice and in 10 weeks, has $512. His brother, on the other hand, spends it all right away on various small items, then regretfully watches as Brock uses a portion of his savings to buy a telescope for himself and gifts for others. At the end of the book, Rock has learned the value of saving and both boys are shown as millionaires in their old age. A section at the end charts Brock's savings, as well as what would have happened if he'd spent some of it right away. 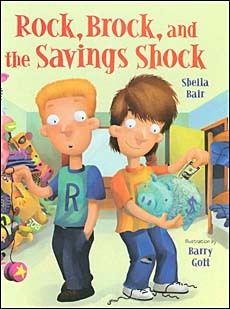 School Library Journal called this book "a good way to examine the issue of saving vs. spending." Below are two sample pages from inside this book. 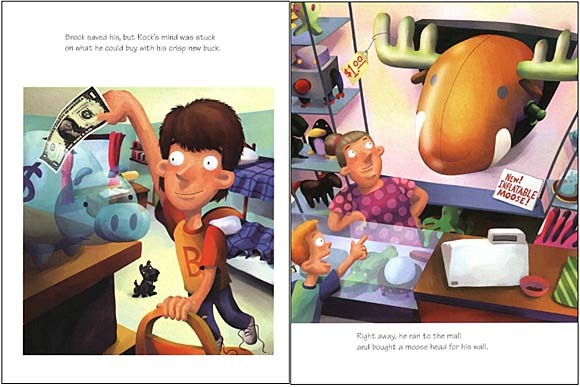 We know our small versions are perhaps a little hard to read, so here's what they say (Left:) "Brock saved his, but Rock's mind was stuck on what he could buy with his crisp new buck." (Right): "Right away, he ran to the mall and bought a moose head for his wall."